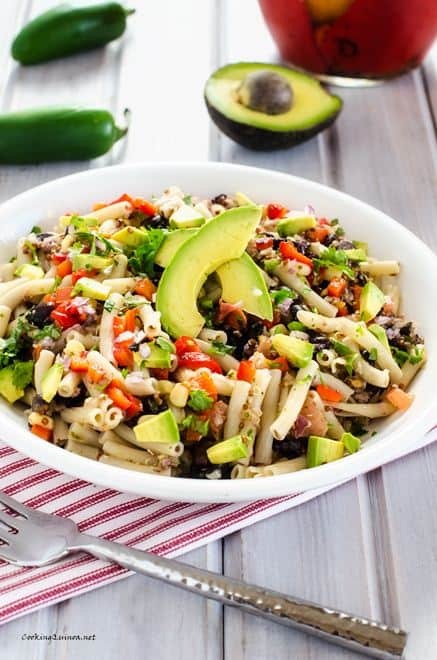 This Southwestern Quinoa Pasta Salad is a deliciously healthy pasta salad that you will find yourself craving time and again. 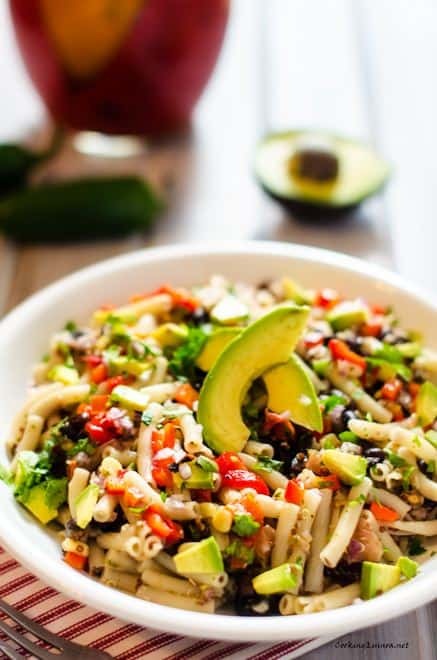 The dressing has an oil-free option, making it easy to fit into your dietary plan. I love New Year’s because I thrive on change and the idea of new beginnings. Like many of you, I’ve been thinking about how I want 2013 to look. And the first place I’m starting is with my diet. The last few days I’ve really cleaned things up and I already can tell a difference in how I feel. In this vein, my big and immediate goal for 2013 is to finish the pregnancy strong, focusing on making sure I am eating nutritious real food and keeping the less-nutritious treats to a minimum. (i.e. I’m not going to be making lunch of homemade pretzels…no matter how much “the baby likes them”. Instead I’ll have a big salad with a few pretzels on the side.) It’s really the best kind of “diet” plan because instead of focusing on limiting my intake or total control, I instead have goals of making sure I get enough greens, raw veggies, fruit, beans, etc. I am hoping that this mental shift will become a permanent part of my relationship with food. Of course, I have lots of other things I want to do next year! I just am trying to sift through what is going to be realistic with a newborn. 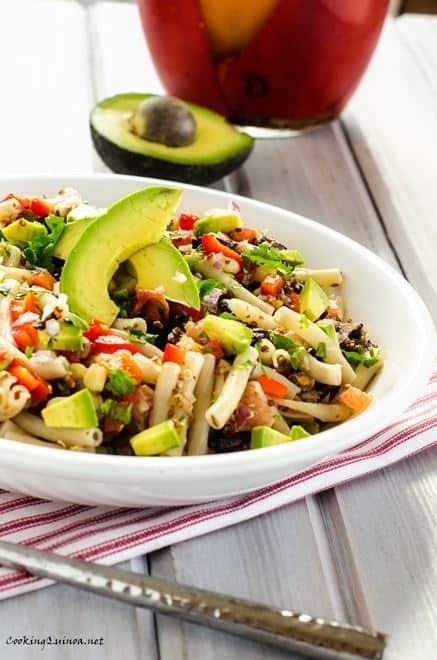 Today, I’ve got a great healthy quinoa pasta salad for you. 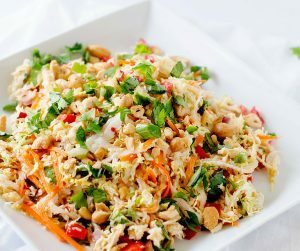 It’s the perfect take along lunch and high in both fiber and Vitamin C! 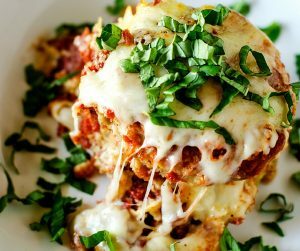 I think it would be great with a little Daiya or cheddar added in, though I absolutely love it as is. Combined cooked pasta with quinoa, beans, tomato, corn, red pepper, jalapeno, and red pepper. Toss with dressing, reserving a little if desired. When ready to serve add in avocado and additional dressing if desired. 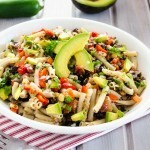 I’ve never thought to try quinoa in a pasta salad before!